Influence is our new line of adjustable height tables and desks. 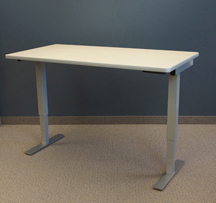 The Influence line was developed to meet the growing need for standing desks and adjustable height tables. Available in two adjustment options, crank or counterbalance, both options are simple to use and do not require power. Watch our video demo to see how they work. The Influence table with a crank adjustment works well when lift capacity is over 200 lbs. This option works well for standing desks with multiple monitors and desktop items. Influence tables with counterbalance adjustments offer less lift capacity, approximately 40 lbs., but offer quick height adjustment, making them perfect for meeting, classroom, or laptop applications. Watch the video below to see for a quick demo. If you would like even more information download our Table Brochure or contact us to start a quote 800-678-5550.